The founder of Discount Tire, Bruce Halle, passed away just after the start of the new year. 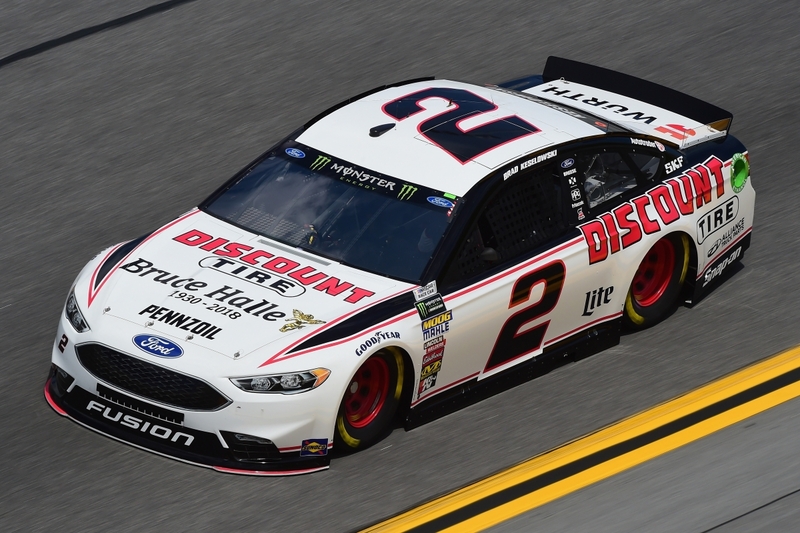 As many of you know, Discount Tire sponsored the Team Penske No. 22 car in the Xfinity Series, and just this fall, announced it was coming on board to support the No. 2 car in the Monster NASCAR Energy Cup Series. Mr. Halle, to me, was a very special person, and his life embodied many things that move and inspire me. He didn’t come from a prominent business family. He went through a tremendous business failure early on. But he continued to work hard and didn’t give up. He kept trying, and it paid off in amazing ways—not just for him, but for many, many people he helped along the way. We’re going to honor Mr. Halle by running a special Discount Tire paint scheme in the Daytona 500, and as part of doing that, I want to use this blog to talk about him and what made him special. I admired a great deal about him, and learned a lot from him, too. Mr. Halle was born in Massachusetts, but he grew up in the same metro Detroit area I did. He joined the Marines and went to Korea, and he once told me a story about he and a bunch of his buddies who were in two foxholes that were right next to each other. The one next to him got blown up and everyone got killed. He survived. After he came back from Korea, he went to college and eventually started an automotive business in Michigan that went bankrupt in his 30s. His partner in the failed business left him with six tires. He took those six tires, sold them, and then kept selling used tires, selling them for almost nothing. That’s where the name Discount Tire came from. He started with a store in Ann Arbor, just outside Detroit, and grew the business until it was one of the most successful companies in America, which is pretty remarkable. The special Discount Tire paint scheme Brad will be running to honor Bruce Halle at Daytona. He was a self-made man, and Discount Tire was privately owned, too. And that’s just the beginning of what made him great. He also probably has the best reputation of anybody I have ever worked with. Period. The people that worked for him loved him. The community he worked around loved him. He had a huge foundation that he personally donated millions to. He created a scholarship that sent some 2,700-plus of his employees’ children to college. A powerhouse of good came out of his success. He showed that you could be a capitalist, and be a good guy, too. I met Bruce in the summer of 2009. Roger Penske and I had talked about having me drive for him, and I’d explained that I’d only do it if we had an Xfinity team. So he went out and worked really hard to land Discount Tire as a sponsor. But Discount Tire had one small caveat before they would agree to sponsor the car. They wanted to meet me. So one Wednesday during the middle of the race season, I flew to Scottsdale, Ariz., to meet Bruce Halle. We sat down and had lunch, and we talked. He asked me about where I was from. He asked if I thought we could win. (I did.) We talked about family. We talked about life. We talked about a lot of things that weren’t related to racing. A lot of things struck me about him that day. Most people that run a huge, self-owned company the size of Discount Tire have gigantic egos. They show very little humility. He wasn’t that way. He was really quiet and humble. He was a very good listener. Nothing was set when I left that day. But later that night, I heard from Mr. Halle. He said he would sponsor the car. If it wasn’t for Bruce Halle, I wouldn’t be at Penske. I wouldn’t have the wins. I probably wouldn’t have the championship. I don’t know where I would be, but he was another really important person in terms of getting my career off the ground, and a lot of people don’t know that. As I got to know him later, I got to see how great he was with his employees. Just the way he talked with them, the way he listened to them, how lighthearted he was—it was really refreshing. Every year, Mr., Halle would invite me to meet him in Lake Tahoe, where he had this employee retreat. And at the employee retreat, he would take his best people. We’re not just talking store managers. If you were one of the best tire changers at Discount Tire, you might be in Lake Tahoe on a paid vacation with your family. I was lucky enough to get to know his son-in-law, Michael Zuieback, at those trips as well. As the new CEO of Discount Tire, Michael is going to do an amazing job continuing Bruce’s legacy. What I loved about those meetings was the way Mr. Halle talked and engaged with everyone. He shared his thoughts about his company with everyone who was there, and the values he wanted it to stand for. One of my favorite things Mr. Halle did was institute a policy where if our car won, everyone in Discount Tire corporate got to wear jeans the next day. Everyone. The five values of Bruce Halle. I went to Mr. Halle’s funeral, and I have to tell you: It was one of the toughest funerals I’ve ever been to. There were so many people there, from so many different walks of life. He was 87, and for people that age, the sentiment is typically something like, “He lived a good life.” For him, you could feel that his impact would really, really be missed. There was a lot of crying. It spoke to how much the community thought of him, and to the legacy he left behind. Be honest. Being honest is something I’ve tried to be. These blogsare meant to be just that, an opportunity to communicate things as truly as I can. I plan to continue to do that, both in my blogsand in social media in general. Work hard. I plan to apply all my effort to being successful on and off the race track, whether it’s to benefit the community or outside business interests. I’m working on some new things and ventures in the community, and will be applying myself to the utmost of my ability to continue to work hard for the community, whether it be my foundation or outside business interests. Have fun. How am I committed to having a little fun? With my daughter and my wife, mainly, by going on trips this year, and doing some really neat things. There are dinners I intend to have with my team, and other events. That’s how I plan on having fun. Be grateful. Mr. Halle always talked about being grateful. To that end, I’m going to continue to acknowledge God, show humility and always be appreciative of my team’s efforts. Pay it forward. Finally, I’ll be paying it forward through my foundation and the things we do there. 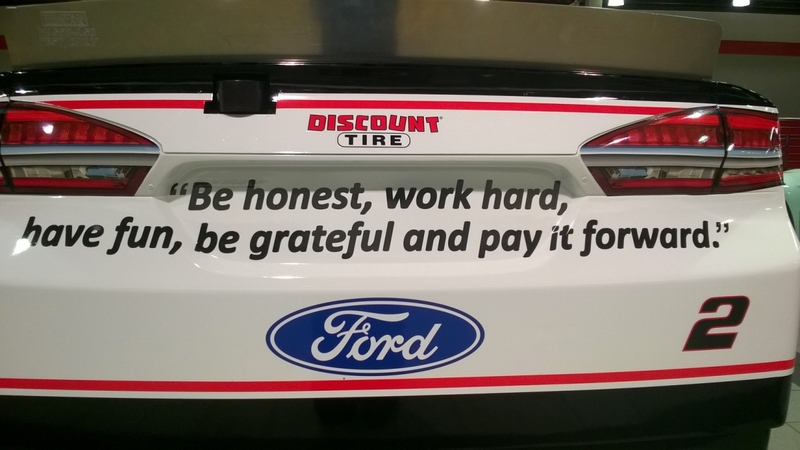 In the past, I also would have said that my truck team was part of paying it forward since we were giving new drivers a chance to make their mark. But since the team is gone, I’m going to lean more heavily toward the foundation. I’m thrilled to be honoring Mr. Halle at Daytona with the paint scheme you see here. It’s got his five values on it along with an angel, and hopefully, we can get it to Victory Lane. More than anything, though, I’m excited for people to see the car, and maybe learn a little more about Mr. Halle’s story. Hopefully, he can be the kind of inspiration to others that he has been to me. Awesome values to live by.So glad he was part of your life and helped you become the person you are today. Your parents had a lot to with that also. Thank you for sharing this story. I love the Checkered Flag Foundation and everything it stands for with helping the veterans. Keep on doing what your doing and you will go all the way Brad. #Goingfor2 always. Great article! This is why I love Brad Keselowski! Thanks Brad for writing such a touching peice. My mom has worked for Discount Tire Corporate office for 30 yrs. She new him well and I spoke with him a few times too. I remember when I was 8 or 9 and my mom brought me in for bring your child to work day… she had me sit at his desk with my feet up. He thought it was funny and was very kind to me. I was one of the many kids that received his scholarship for college and have now been a nurse for 10 yrs. He has done so much for my family and me. He will be truly missed. Beautifully written it brought me to tears. Hopefully Mr Halle will be the Angel that gets you to victory lane. These are great values to live by. Never had the chance to meet Bruce buy have met you. We buy our tires at Discount Tire in Bay City,Michigan. The personnel there are super nice people and I’m sure Bruce was very proud of them. Thank you for sharing a little about him. I saw the quote on your bumper and I knew WHO said it, but I loved learning more about that man, and your desire to apply those values to your own life. Best of luck today! Every one should have that special person in their life. I lost my son at 27, not long ago. I often told him I should be more like him. I never got to say goodbye. We should all do the first before we can’t do the second. I’m extremely proud to work for Discount Tire through the last 12 years. I’ve been given the opportunity to meet Brad twice through different Discount Tire events like he describes in his article. I can’t even say how happy it makes us to see Bruce honored for the big race, and I’m positive he’s just as honored and will be watching! Wow, that was truly insightful and inspiring. These are traits we could all emulate and the world would be better off for it. Thanks for all you do for he sport and for the community. You will get your reward in heaven. Good luck this season and go get a win today. Great story Brad, thanks for sharing it .. Thank you Brad for sharing a remarkable mans story and i hope that you are successful at all of the 5 core values that you shared with us. I will take your lead and try and live by them all as well. The world can only become a better place if everyone tries to be a better person. This is great, Mr. Keselowski. Thank you for taking the time to tell this story. It’s inspiring. Brad – It is a pleasure to get to know you and these 5 values speak volumes to Mr. Halle, what he has meant to you, and to you as a person. When we have talked, I see and feel this in your eyes, voice, and passion. These are 5 values that I have learned and sometimes need to remind my self, if I feel that I’m out of balance. Thank you and nothing but the best for you and your great team for today’s Daytona 500 and for the entire season! Great blog! Good luck following through on those 5 values. Make Mr Hall proud. He is always with you! great story. Make him proud! He’ll be watching. Was truly a good man that had a tremendous effect on your life. Now you are paying it forward by sharing these great values that if used will make the world a much better place. Thanks Brad. Thanks for sharing. Mr. Halle’s life story with us, it meant a lot to me. It really shows the kind of person that you truly are. A lot of people in your position wouldn’t take the time to get to really know the people around them like you have let alone share it with the rest of the world. Thank You so much Brad!!! Wow. I’m really awe struck now. You have a great sense of insight and appreciation for people that defy the odds. I picked you as a favorite driver some several weeks after my brother died in Jan 2012….. and hand to God, when I picked you…..I did not know you were the NASCAR champ for 2011 or was it 12? Anyway, I I caught an interview on tv and thought…. wow, I like that kid and he drives a ford! Done! I proceeded to call my mama and tell her I have a favorite NASCAR driver. Brad!. My mama loved jeff gordon through and through …. but it’s no fun and picking same person. . ….Now onto the guns and school. I’m speechless and that’s not a event that occurs often but you’re right, Brad, I agree with you. Thank you for having Mr. Hales words for wisdom on your car. I plan to follow those Ideas for along time.As a fund raiser for your foundation you may try selling bumper stickers with Mr Hales believes on the bumper stickers.